We will show you how to set up Apache with HTTP/2 support on Debian 9. HTTP/2 is a major revision of the HTTP network protocol. It is derived from the experimental SPDY protocol developed by Google. The primary goal of HTTP/2 is to reduce the latency, minimize the protocol overhead and add support for request prioritization. This makes the web applications to load much faster.High level syntax like status codes, methods, headers fields, URIs etc. are the same as the earlier version of HTTP except there is a difference on how the data is framed and transported between the client and the server. The Apache web server version that is available in the Debian 9 repositories has HTTP/2 support out of the box. Basically, when you install Apache web server on your Debian 9 VPS, you have the HTTP/2 module available to use. There is no need to install Apache from source like before when the earlier versions of HTTP/2 were not ready for production. Once you add the line related to protocols in your Apache virtual host file, you have to restart Apache again for the changes to take effect. Please note, the order of protocols is relevant so the first one is the most preferred protocol when the client offers multiple choices. Here, h2 means HTTP/2 will be used over TLS (protocol negotiation via ALPN), while h2c means HTTP/s will be used over TCP. http/1.1 means that if the client doesn’t accept HTTP/2 then the request will be served over HTTP/1.1. To check whether HTTP/2 is successfully enabled in Apache you can use RoseHosting’s online HTTP/2 checker tool or any other similar tool available online. 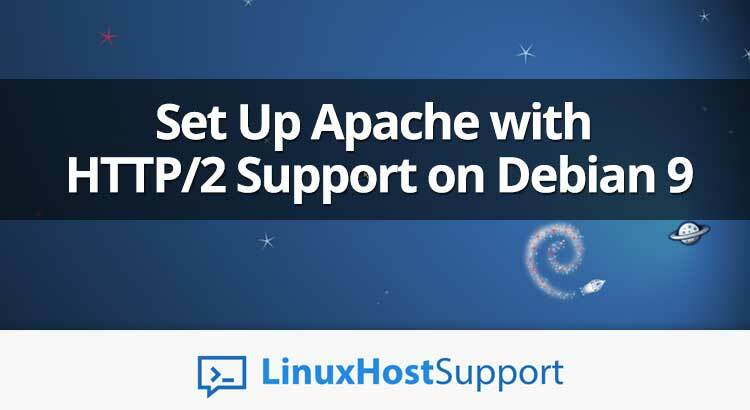 Of course, you don’t have to set up Apache with HTTP/2 support on Debian 9, if you use one of our Linux Server Management Services, in which case you can simply ask our expert Linux admins to set up Apache with HTTP/2 support on Debian 9 for you. They are available 24×7 and will take care of your request immediately. PS. If you liked this post on how to set up Apache with HTTP/2 support on Debian 9, please share it with your friends on the social networks using the buttons on the left or simply leave a reply below. Thanks.